Kaja Foglio is a Seattle-based writer, artist and publisher. She founded Studio Foglio, LLC in 1993 as a venue for her Magic: The Gathering art prints, but quickly expanded into publishing. 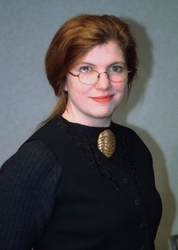 She co-writes the comic series Girl Genius with her husband Phil, and is the chief graphic designer and web mistress for Studio Foglio and Airship Entertainment, and masterminded their stunningly successful transition to webcomic form. You can read Girl Genius comics online at www.girlgenius.net.